Janesville Farmers Market » How Much Local Food Did You Store? How Much Local Food Did You Store? How Much Local Food Did You Store for the Winter? January is here with a light covering of snow and cold temperatures to match. This is the time of year when our farming ancestors lived off meat, fish and whatever food they had stored in their root cellars. Storage foods might have included dried grains and beans, root vegetables, onions, garlic, cabbage, sauerkraut, sausages, cheese, nuts, dried fruit, home-canned goods, rendered fat and salted meat. Our great grandparents preserved food to save money and out of necessity. Today we are seeing a renewed interest in many of these self-sufficiency skills. In spite of prevalent grocery stores, many of today’s consumers want to play a more active role in choosing and storing their own food. Farmers, home gardeners and farmers’ market shoppers want to utilize the summer surpluses to save money on food year round. How many of the following food preservation methods did you use this year? Home Canning: Canning is the process of sealing food in an airtight jar or bottle using a boiling water bath or a pressure cooker. Properly canned foods are safe to eat for 1-5 years. Acidic foods, such as sauerkraut, pickled vegetables, and foods that have added acid, may be safely canned in a pot of boiling water. Other vegetables, meats and sauces must be canned with a pressure cooker, which can reach temperatures above boiling to kill harmful bacteria, such as Clostridium botulinum. If you would like to learn more about canning your own food, seek out a local expert and some tried and true recipes, such as those offered at http://www.foodsafety.wisc.edu/preservation.html. 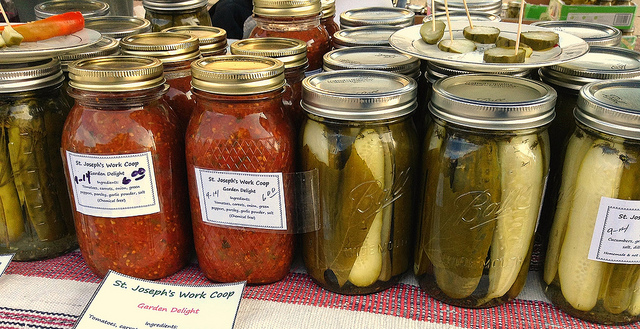 Farmers may sell acidic home-canned goods at the Farmers’ Market through the Pickle Bill. Food Drying: Dehydration can be used to preserve everything from veggies to meats (beef jerky). Drying is one of the oldest food preservation methods. While our ancestors relied on sun and wind to dry their food, we now have the benefit of electric food dehydrators that do the job in a quick and controlled way. If you think you might be interested in drying your own food, but don’t want to invest much money, you may be able to find a slightly used food dehydrator at a thrift store. Once you have made food drying a part of your routine, you can purchase a more expensive and larger version that allows you to control the temperature and dry larger amounts of food. Drying is great for fruits because they will last longer and taste sweeter. Dried veggies are nice for camping and hiking. Add them to water to make soup. Puree them into powders to add nutrition to smoothies and protein shakes. Drying tip: Slice apples or pears into lemon juice and/or honey mixed with a little water to prevent them from browning too much. Fermentation: Good old fashioned fermentation is really the art of controlled decomposition of food. We make the conditions favorable to the beneficial bacteria or yeasts and inhospitable to the bacteria that will produce off flavors, food born illness and shortened shelf life. After that, we allow the good bacteria to turn the sugars in the food into beneficial acids that will preserve the food. When conditions are right, the bacteria will even increase vitamin content and make the foods easier to digest. We eat fermented foods on a daily basis without even thinking about it. Cheese, yogurt, sour cream, chocolate, tea, wine, beer, vinegar, sauerkraut, soy sauce, fish sauce and real sourdough bread are all fermented at some point in their production. Fermentation, like in sauerkraut or kimchi, will preserve vegetables for up to a year. The probiotic-rich ferments are used as condiments to add flavor to meals and enhance digestion. There are several good books available to help you learn how to make your own fermented veggies and fruits. Using a saltwater brine is probably the easiest method. Here is a video that shows how to brine fresh vegetables so they can ferment into pickled veggies. Freezing: Of course, modern technology gives us one of the safest methods of food preservation, freezing. If you have the freezer space, many fruits and vegetables can be frozen at the peak of freshness for fast, local food meals throughout the winter months. Even in the freezer, most veggies will continue to have a small amount of enzyme activity, leading to diminished taste and texture, and eventually spoilage. That is why we “blanch” the veggies before freezing by submerging them in boiling water. We don’t want them to get all the way cooked. We just want to stop enzyme activity. That is why the boiling water is followed up with ice cold water. Then we freeze them in freezer-safe containers. Peppers and berries do not have to be blanched. Simply wash, dry and cut them before freezing. If you want the berries to freeze separately rather then clumping together, freeze them on a cookie sheet before moving them to storage containers. Don’t forget to label and date your containers. Frozen fruits and veggies will keep up to a year, but are best within six months. Root Cellaring/ Cool Storage: Many vegetables will store for long periods of time with very little effort. They only have to be kept in a cool, dark, humid place. Potatoes, onions, garlic, carrots, beets, winter squash and turnips will keep for quite a long time in a root cellar environment. Some houses still have root cellars in their basements. If you are interested in getting started with root cellaring, check out this article: http://www.organicgardening.com/cook/preserving-your-roots-cellaring-primer. These are some of the most common methods of preserving summer’s bounty. Are you currently enjoying any foods that you preserved or stored from last summer? Which methods would you like to try this coming year? Watch for classes from Janesville Farmers Market throughout the year to learn more about preparing and storing food from your local farmers.